This automated solution, available through Loan Product Advisor, gives you time to underwrite more loans. Get your edge. Lenders face rising interest rates and a shrinking borrower pool. But innovative technologies can help lenders broaden their borrower base by making it easier to lend to the self-employed homebuyer. working Americans are either self-employed or working for the self-employed. Lenders face a complex and time-consuming task when validating the income for self-employed borrowers. Processing mortgage applications for self-employed borrowers is complex. Freddie Mac is teaming up with fintech company LoanBeam to make it easier for lenders to validate the income of self-employed borrowers. This way, lenders can spend more time cultivating relationships and delivering value to clients. How people earn money today is shaking up the mortgage industry. 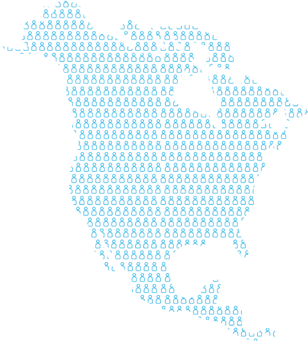 The U.S. workforce is made up of more nontraditional income earners—contractors, freelancers and on-demand workers—than it was a decade ago. And, many of them are looking to buy a home. But underwriting mortgages for these self-employed borrowers is complex and time consuming, a reality that discourages lenders from marketing to this group of prospective homebuyers. 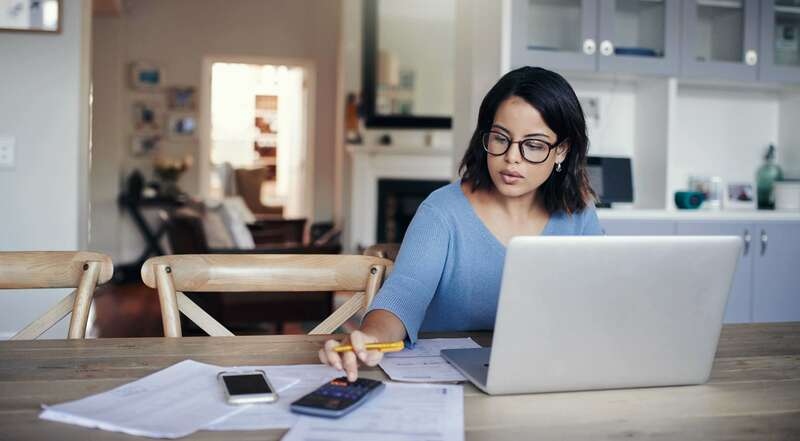 With rising interest rates set to increase competition for borrowers, lenders cannot afford to overlook the self-employed customer. The good news is that technology has reached a point whereby it can automate and accelerate the income validation process for nontraditional wage earners, offering lenders an opportunity to innovate their approach to this customer segment. So, what does higher work satisfaction, the burgeoning on-demand economy and the growing reliance of companies on contractors mean for lenders? The bottom line is that they’ll be confronted with more loan applications from self-employed homebuyers and, with them, the challenge to work smarter. While lenders can’t change their practices overnight, they can incorporate new technology into them—in ways that strengthen their current capabilities. They can speed up mortgage application processing and, in this specific case, validate income more smoothly and quickly for the self-employed borrower. The technology that stands to change the game is based on optical character recognition, or OCR. Built into software programs that integrates into lenders’ systems, OCR offers them a way to automate further and, in doing so, to compete more effectively for self-employed borrowers. OCR programs extract and ingest information from tax returns and other mortgage application documents, and then they generate a total income figure. Software programs predicated on OCR then automatically populate relevant data into a pre-formatted workbook (see below). The workbook can be customized to incorporate government-sponsored enterprise (GSE) income guidelines and lender-specific requirements. The reality of increasing interest rates only makes it more incumbent upon lenders to seek innovative solutions in casting a wider net for borrowers. The upside is that the necessary technology exists. Lenders can take advantage of it to free up their employees to cultivate client relationships and measure risk more accurately, leading to a faster turnaround time for borrower and lender. At the same time, they can leverage these solutions to scale their business and improve operational efficiency, giving them an edge against competitors. For more information, visit LoanBeam and Freddie Mac Loan Advisor Suite®. Automatically extracts and ingests data from the documents, searching for relevant data points that provides lenders with a complete income snapshot of the borrower. Identifies missing documents into a single report, so lenders can quickly get what more they need from borrowers. Outputs data into a pre-formatted workbook format—customized based on lenders’ needs and GSE guidelines—whereby lenders can quickly determine qualifying income. Today, some 14 million borrowers are self-employed. And if experts prove correct, this number is bound to increase in coming years. It’s a trend that will exacerbate an existing problem for lenders—how to speedily and efficiently process mortgage applications for nontraditional wage earners. 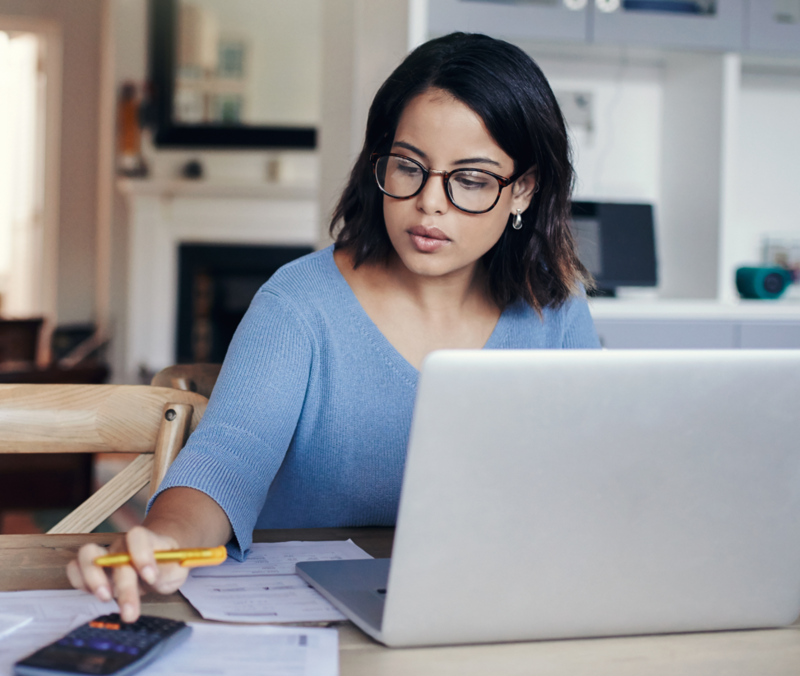 To underwrite self-employed borrowers, lenders must dissect a customer’s tax returns—versus a W2—to validate his or her income. Complicating matters is the fact that the self-employed are incentivized to reduce their taxable income through deductions and write-offs. Loan officers and processors often must then manually reconcile dozens of pages of tax documents—including 1099s, Schedule C’s and other forms—to arrive at a reliable income total. The income-validation process can take days to unfold. Loan processors often discover that essential information is missing from a file, requiring more back-and-forth between borrower and loan officer. Processing these mortgage applications translates into higher operational costs for lenders, who need to beef up staff and training to handle these customers. About 30% or 44 million working Americans are either self-employed or working for the self-employed, according to a study by The Pew Research Center. The McKinsey Global Institute (MGI) estimates the number of self-employed workers to be higher, between 54 million and 68 million. Most self-employed Americans actively decide to work for themselves. A study by the Freelancers Union indicates that 60% of freelancers become independent contractors by choice. Answering the MGI survey, freelancers reported higher satisfaction than those with traditional jobs on 12 out of 14 aspects of their work life. The “gig economy” has a lot of room to grow, and that means more people will make a living this way. While the JPMorgan Chase Institute estimates that 4% of the working-age population has earned income through “sharing economy” platforms, McKinsey says that some 15% of independent workers have used them to make money. Spend hours - even days- to reconcile data from different sources and compute income. Generate new business by easily underwriting more self-employed borrowers. Now you can focus on analyzing other credit risks and making your underwriting decisions. Inputs the income calculation to meet Freddie Mac's requirements. Review and resolve potential errors to validate income calculation. Extracts and ingests data from tax documents with 99.7% accuracy. Keep pace with the growth of the self-employed population. Manually capture data from complicated tax returns. Today, industry experts estimate that there are some 14 million self-employed borrowers in the U.S., and that this number will grow sharply. As for lenders, they’ll have to figure out a way to more efficiently and speedily process mortgage applications for this group of prospective homebuyers. At Freddie Mac, we strive to introduce solutions that lenders can use to grow their business. To this end, we’ve teamed up with fintech company LoanBeam to help our lenders reduce origination costs and deliver a better borrower experience. 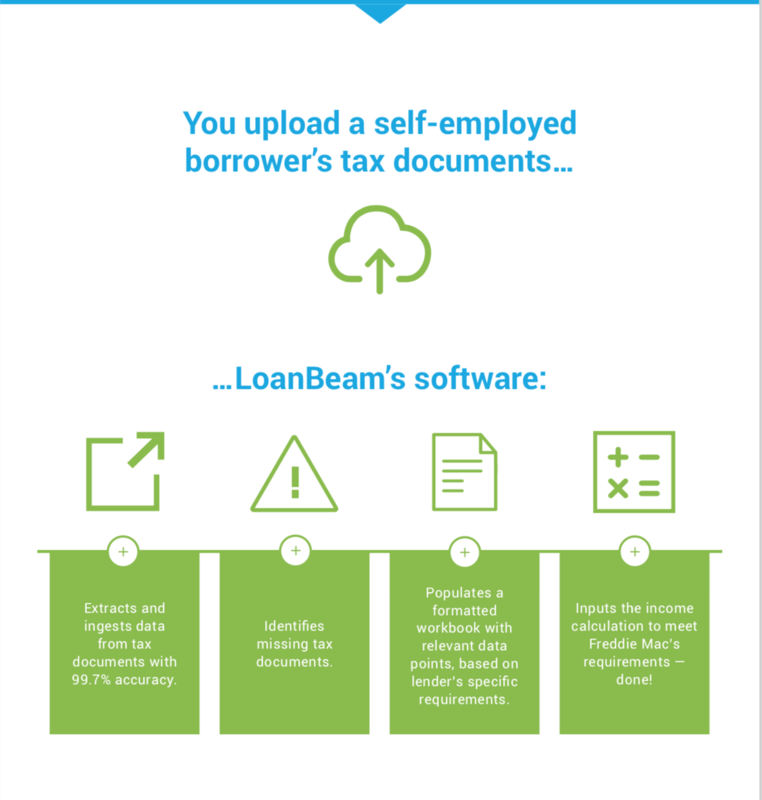 LoanBeam’s highly refined optical character recognition (OCR) technology extracts and ingests information from a borrower’s tax returns and other relevant data, and then calculates an income total based on what it’s read. Its software —tested over the last 14 years by having scanned millions of tax documents—has a 99.7% accuracy rate. We believe technology like this will not only help reduce errors for lenders that stem from computing income manually, but it will also help lenders achieve scale when working with nontraditional wage earners. I think the technology’s value will grow exponentially, as the number and complexity of the mortgage files increase. All of this should translate into higher productivity, lower origination costs and a competitive advantage in the growing self-employed borrower market. We’re currently working with LoanBeam in an offline pilot and will soon integrate its technology with Freddie Mac’s Loan Product Advisor®, our automated underwriting system. As the origination process evolves, we’re committed to working with our lenders to meet the challenges that lie ahead. Contact your Freddie Mac representative to learn more. In a recent study, LinkedIn predicts that 43% of U.S. workers will be freelancers by 2020, compared to 6% in 1989. Three in 10 U.S. jobs are held by the self-employed or the workers they hire, according to a report by the Pew Research Center. The number of self-employed Americans increased to some 41 million in 2017, up almost 3% from 2016, and they now represent 31% of the private workforce, per a study by MBO Partners.